Mom clipped this recipe from the April 1976 issue of Better Homes and Gardens. I was just cough-cough-9-years-old-cough-#omg-gasp at the time. In the original recipe scan below you can read the story about how this recipe was chosen for the “He Cooks” section of the magazine. While my first attempt at this recipe didn’t present as beautifully as I had hoped, it was surprisingly tasty. Mastering my Nikon DSLR is a constant work in progress so I’ll plan on another photo session when I make this tasty dish again. ❤ Looking for polenta in the ingredient list? You won’t find it there labeled as such, but cornmeal is often used to make the Italian dish, so there you have it! Besides, eating “Beef Cornmeal Pie” just doesn’t sound as tasty. To learn more about the differences (or not) between polenta and cornmeal visit this nice article I discovered. ❤ Me gusto processed American cheese. We used Velveeta slices for the polenta pie topper then later revisited the article and saw the stacked pyramid shape (below) which had more foodie flair than our cheese-flung approach. I think next time I make this I will grate cheddar or mozzarella to better coat the top of the pie. ❤ If you don’t want to make the “peppy sauce” below, you can substitute it with your favorite homemade or jarred sauce. Here’s one of mine. We preferred doubling the peppy sauce recipe to yield 2 cups of sauce. I guess I’m a saucy kinda guy. 1. 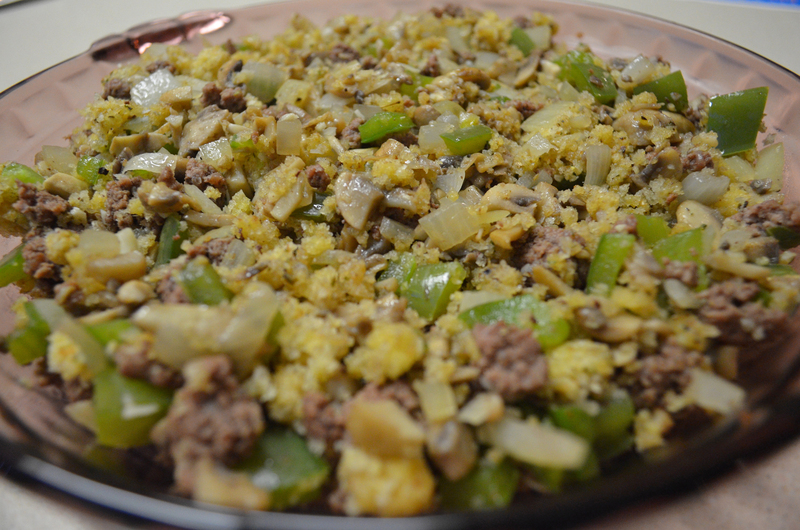 Make the beef mixture: In a 10-inch skillet, cook the ground beef, mushrooms, green pepper, onion and the garlic until beef is browned and the veggies are tender. Remove from heat and set aside. In a bowl, combine egg, bread crumbs, 1 teaspoon salt, oregano, pepper and the hot pepper sauce. Combine this mixture with the meat mixture. Turn into an ungreased 9-inch pie plate and set aside. 2. Make the cornmeal mixture: In a medium saucepan combine the cornmeal, ¾ teaspoon salt and the water. Cook and stir over medium heat until it’s thick and bubbly. Spread this mixture atop the meat mixture that’s been waiting for you in the pie plate. Cover with foil then bake in a 350°F oven for 30 minutes. Uncover the pie and top it with the cheese. Return the pie to the oven until the cheese melts, about 3-5 minutes more. Let stand 10 minutes before serving. 3. Make the peppy tomato sauce (if not using your own sauce substitute): Combine the tomato sauce, garlic salt, celery salt and the Worcestershire sauce. Heat through. Makes about 1 cup of sauce. 4. 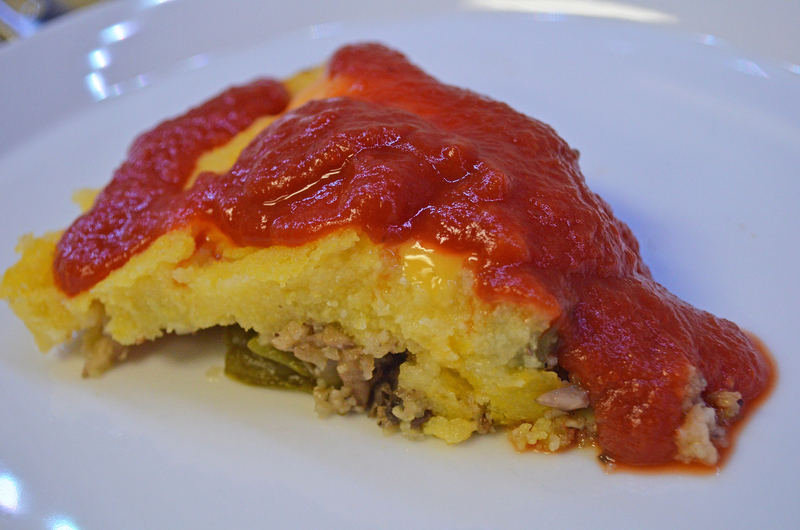 To serve: Cut your polenta pie into your desired wedge and top with the sauce.